If you were fired, this may seem like the end of the road. You could be afraid that no one wants to take a risk hiring you, or feel overwhelmed by your emotions. These reactions are perfectly normal, but don’t let them stand between you and your next great job. Take charge of your career future with these strategies. Now that you are aware of some of the factors that influenced your termination, it is time to plan how you will address the matter in your interview. Write and practice a script for answering a question about whether and/or why you have been fired. Exactly how you should go about this varies. Laid off job seekers can simply state that the company was reorganizing, downsizing, etc. This happens often enough that hiring managers are unlikely to be concerned. To be on the safe side, however, try to have someone from the company write you a recommendation. Since your behavior wasn’t the motivating factor behind your termination, there shouldn’t be any reason not to get one of these letters. If fired for cause, you should spend most of your answer discussing what you learned from the experience. Avoid examining what you did wrong too closely, or debating whether the employer’s reaction was fair. 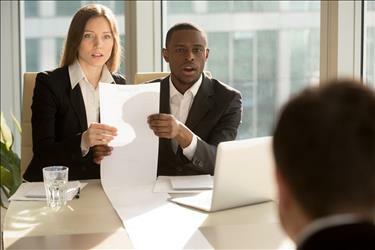 Wrongful terminations can be touchy subjects for employers concerned about risk and lawsuits. Keep your description of the incident as broad and unbiased as possible, simply stating that you were fired illegally and took steps to settle the matter. While each situation above requires a different approach, there are some qualities that every previously fired interviewee’s script should have. Honesty: Most importantly, don’t lie or fudge the truth. The danger that a potential employer will call up your previous manager and ask why you were fired is just not worth it. Think of this as your chance to put your termination in a more positive light. This outline can be applied to any number of circumstances, as shown by Beth Colley’s sample responses and Dawn Rasmussen’s guidelines. Try to focus on the future, something you learned, or a reason why this position is a better fit than the last one was. Brevity: You don’t want the hiring manager thinking too much about why you were fired, or growing bored while you ramble about your old job. Besides, do you really want to keep dwelling in the past? Mention the relevant topics, and move on. Unbiased: A good script should be calm and focused. Though it may be difficult, don’t get angry or blame your previous boss. Above all, be prepared to show that you are a competent professional excited to get to work. Your preparation for the interview and confidence during it will work to reassure future employers that your past is not necessarily an indication of whether you will benefit their organization. Wise Geek: Should I Tell a Potential Employer that I was Fired from a Job?